PRESS RELEASE: Billerica, Mass. — Nuvera helped celebrate Boston’s first zero-emissions fuel cell bus and hydrogen refueling station at a recent press event attended by Massachusetts and MBTA officials. The bus and station are deployed at the Massachusetts Bay Transportation Authority (MBTA) through the National Fuel Cell Bus Program (NFCBP), which is sponsored by the Federal Transit Administration (FTA). The NFCBP is helping bring fuel cell and hydrogen technology into everyday use and expand clean transportation in our nation. Hydrogen-powered fuel cells enable zero-emissions buses to run by converting hydrogen fuel into electricity and water with no exhaust pollutants. The result is an electric vehicle that is quickly refueled instead of being recharged. Fuel cells increase fuel economy, reduce use of petroleum, and advance U.S. energy independence since hydrogen is produced domestically. The event showcased recent additions to the MBTA bus fleet. MBTA Interim General Manager Steve Poftak described MBTA’s commitment to sustainability and improved fuel economy. 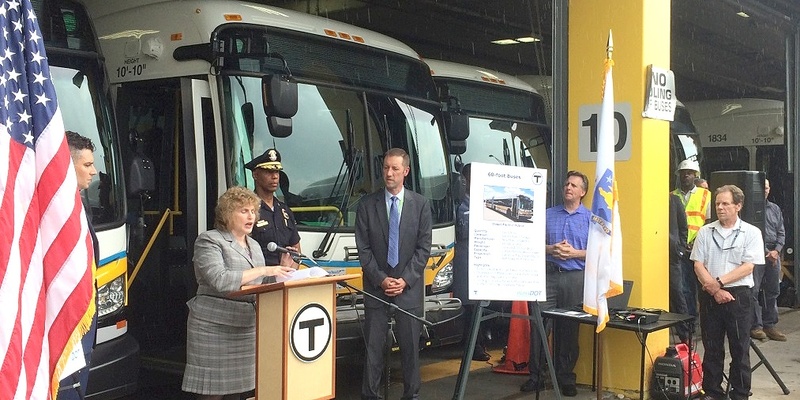 Massachusetts Secretary of Transportation Stephanie Pollack (pictured speaking below) highlighted investments in bus service and MBTA Deputy General Manager Jeff Gonneville introduced MBTA buses with state-of- the-art propulsion systems including the fuel cell bus. Since the roll out of the fuel cell bus in 2016, MBTA customers have been able to experience this quiet zero-emissions transportation on routes around metro Boston. Jon Taylor, Nuvera CEO, described this program as an exciting opportunity to familiarize the community with hydrogen fuel cells and help expand alternative energy and jobs. Nuvera, located nearby in Billerica, MA provides hydrogen stations for mobile and stationary applications including forklifts, buses, and industrial gases. The program is providing a fuel cell bus and hydrogen station to MBTA for an in-service demonstration that began in 2016. The current phase covers through early 2018. Funding for the bus and station is provided by FTA and Nuvera. Nuvera manages the program while the nonprofit Northeast Advanced Vehicle Consortium (NAVC) administers the grant on behalf of FTA. This public-private collaboration is helping familiarize transit agencies with fuel cells while providing valuable on-road feedback to manufacturers as they look to expand production. It is also helping grow the green economy and U.S. businesses that produce the vehicles, drivetrains, and hydrogen fuel. The fuel cell bus team has an experienced lineup including BAE Systems, ElDorado National, and Ballard Power Systems. BAE Systems is the bus system integrator and designed the hybrid propulsion system that combines a fuel cell and battery to roughly double fuel economy over compressed natural gas (CNG) buses. ElDorado National is the bus supplier and incorporated a stainless steel frame for the Boston climate. Ballard is the fuel cell supplier and delivered the module to power the bus. This team has already deployed fuel cell buses in warmer climates such as southern California. The Boston bus is testing performance in Northeast weather conditions. Feedback from this FTA program will help pave the way as an important step toward wider adoption of fuel cell technology in transit. The hydrogen station (pictured below) is designed and operated by Nuvera and is located at MBTA’s Charlestown facility, which supports about 260 buses and 54 service routes around metro Boston. The station generates hydrogen onsite from natural gas and water through a process called steam methane reforming (SMR). Purification and compression steps then ready the hydrogen for dispensing into the bus. The station capacity is scalable and can grow as desired by adding additional modules. Hydrogen fueling infrastructure plays a key role in expanding fuel cell usage. Nuvera’s onsite hydrogen generator is unique with its small footprint and ability to match the refueling demand by adjusting the production rate and cycling on and off more frequently than large industrial plants. The station utilizes existing natural gas pipelines to create hydrogen onsite and avoid trucking of hydrogen. In addition, these stations can create hydrogen from other sources including bio-fuels. For example, the same hydrogen station technology used in this program was featured in a Toyota video that demonstrates hydrogen production from farm waste.